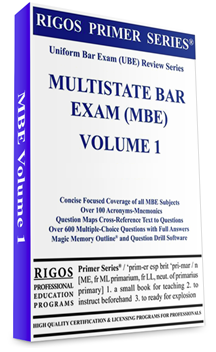 Our comprehensive review material is all you need to pass the MBE administered by the National Conference of Bar Examiners (NCBE) as a part of the Uniform Bar Exam (UBE). This Rigos Review Series MBE text and questions are presented in two volumes. Volume 1 contains the three subjects of Contracts and UCC Article 2, Torts, and Real Property and Future Interests. Magic Memory Outlines, question maps, multiple-choice questions, and answers cross-referenced to the textual coverage are included.